His+Hers: the one store at the mall we kind of want to live in. 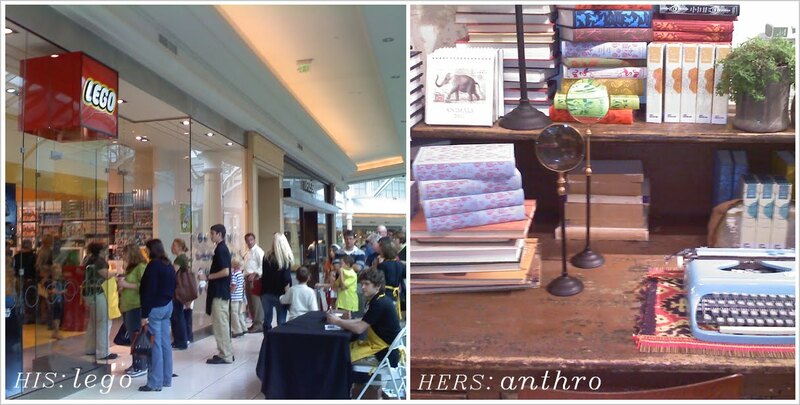 Q's would be the Lego store, and of course mine would have to be Anthropologie. Cute idea! I love Anthro too. Fun idea. I would of course pick Anthro as well, but the Lego store is lots of fun too. Okay Alli, I did it. Fun fun! I've always maintained that there should be an Anthropologie within walking distance from an Apple Store :) That needs to be in all city planning manuals. hahah what a super cute idea!! i'll have to join in on the fun sometime!! I become a little kid all over again in the Lego store. I only seem to get in there once a year, at around Christmastime, because it is so far away in a huge shopping centre. But when I do, I feel the urge to run around saying 'I want that, I want that' like a five year old all over again! I'm posting mine this week on t&f! :) such a good idea! alli, i found your blog via mary of t&f and am just loving it! i love the his&hers idea. i have to agree with you on this one - i worked at anthro for a while in college and i don't think i earned a cent. it all went right back to them. i think i'll post a his&hers next monday as well!